North Island Breeders Association has put together a really good racing syndicate proposal that involves 2 yearling fillies, some of the Chiefs rugby players and a couple of top harness racing trainers. Now you’re invited to join in. What I really like about the deal is that the outlay is very affordable – about $34 a week for a share (that’s $145.50 per month), which is very do-able especially if you rope in a friend or some work colleagues. It’s that cheap because the fillies are leased – you don’t have to stump up for the purchase price. For that you get a couple of very nicely bred fillies, one trained by Steven Reid and the other by Geoff Small. And both have broken in well. Basically, if you are looking for a fun involvement, low risk, and a chance to mix with new friends and top rugby players (some are All Blacks) – and perhaps end up with your own Adore Me……. then this is well worth a look. I am advised the Parade Day has been cancelled. That’s a great chance to have a look at the two fillies involved, talk to the trainers about how they are shaping up, and meet some of the Chiefs players. However if you’re not in the Auckland vicinity, but interested in joining the syndicate, contact Rob Carr and ask him for more information. This is one of the best syndicate deals I’ve seen for a long time in terms of affordable entry. I hope to get up to the Parade and have a reckie myself, and will look closer at the breeding of the fillies at that stage. EVERLASTING GRACE (Bettor’s Delight – Jessie Grace), a half-sister to 9 winners, to be trained by Geoff Small and UNFORGIVING (Art Major – Pure Envy), a half-sister to the 8-win horse CHARGE FORWARD, to be trained by Steven Reid. 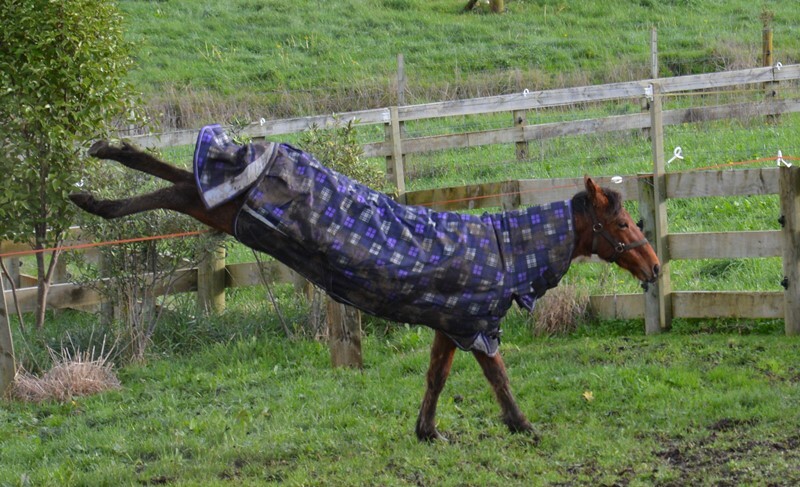 Here’s a photo that captures the joie de vivre of young horses, given a bit of sunshine in the middle of winter. The happy chappy is a weanling colt from bred by Kym Kearns at Isa Lodge, and a full brother to Flying Isa (Pegasus Spur x Sun Isa), and is aptly named Isaputtingonmytophat, after the song “Top hat, white tie and tails” made famous by the likes of Fred Astaire, Tony Bennett and Ella Fitzgerald, but originally written by Irving Berlin. Time for a quick catch up on the virtual yearling stable picks – yearlings from the Sales that we pick without having to pay for them, and then track the results. Briefly my four 2011 stable picks (now 3yos) have been a mixed lot. Sugar Ray Brogden (Grin-Swift Mirage) sold as a hack (palate problem), Outlaw (Bettor’s Delight-Gift Of Grace) going around in Australia for little reward, Eye For A Deal (American Ideal-Illmakemyname) cranking up 6 wins from 22 starts but in the lower staked Australian races, and that leaves Alto Christiano (Christian Cullen-Right This Time) as the standout performer for me, although he had a major injury setback, came back and won the WA Derby and then got another injury. But he’s won over $240,000 to date, so I am ahead on my initial outlay of $120,000! Now for the 2012 picks. I invited others to participate and Sam and Ray joined in. From me (4 colts, 4 fillies from the Australasian at Karaka), Sam (4 colts, 4 fillies from the Premier) and Ray (3 colts, 3 fillies across both) – currently 2yos of course so we don’t expect miracles. And some of them may still be racing over the next month or so, so I will update again at the endof the season. So 3 out of 8 starting as 2yos. On The Rantan (Bettor’s Delight-Funontherun) – renamed On The Town. Nothing yet. Sam also has 3 out of 8 actually making it to the races. So Ray gets 2 out of 6 to the races as 2yos, and a couple of trialists. Overall we are tracking okay. Go to my blog of 25 March 2012 for my original picks and view the Responses/comments for Sam and Ray’s rationales for their picks. You can use the search function on my blog to find all references to the virtual yearling stables concept. This blog is a tripler – all connected to Somebeachsomewhere and what maternal lines bring (or don’t bring) to the table, and whether sire/damsire crosses are all they are cracked up to be. It doesn’t offer nice and simple solutions but is really trying to keep our “breeders minds” open, to keep us thinking. Where to for Artsplace mares? Equineexcellence does some research. Ray Chaplin of equineexcellence.biz has once again produced a thought provoking article challenging a simplistic interpretation of “Breed the best to the best and hope for the best”. I mentioned this in my last blog and will explain a bit more now. If the “go to” sire for Artsplace mares was Rocknroll Hanover, with the tragic death of that horse, should breeders with Artsplace mares switch to Somebeachsomewhere as the next best thing on the block – after all, Captaintreacherous is out of an Artsplace mare (Worldly Treasure). He also looks at whether the Somebeachsomewhere cross with Artsplace mares is all that Captaintreacherous makes it appear. The contribution of broodmare sires is often over estimated in valuable breeding tools such as the USTA and HRNZ “Crosses of Gold” publications. Whilst they can often provide a good lead as to which stallion to breed a mare to, they can just as often mislead breeders. What I like about Ray’s approach is that he does the homework to back up his observations. This is good thought-provoking stuff for breeders. Can you duplicate success by following the same cross? Now I want to look more closely at SBSW’s maternal pedigree. The focus has been on the Mach Three cross with a Beach Towel mare. But I believe a quick glance at his pedigree raises some interesting things. His maternal greatgrandam is The Booger Lady, who got 12 wins herself and was the dam of the very good Cam Terrific (by Cam Fella) and some other well performed racehorses. The descendant families have had very mixed results, with a couple of very nice horses popping up in several of the branches but nothing consistent. The best performed branch is his granddam’s Where’s Sarah (by Cam Fella) who has had two by Artsplace who earned over $300,000. SBSW’s dam Where’s The Beach (by Beach Towel) has had 9 foals for 6 winners including SBSW and 2 others that have won over $100,000 – the rest just average. Four of her foals were by Astreos which indicates perhaps a belief that a top performing son of Artsplace would nick well with the mare given Where’s Sarah’s results with Artsplace. The mare has had two other foals by Mach Three (as well as SBSW) but to date the results are not mimicking the success of Somebeachsomewhere. But the faith is strong: In 2011 a full brother yearling Some Of The Beach sold for $430,000 – the highest price ever paid for an Ontario-sired yearling. With these results it is quite a long bow to draw that the Mach Three x Beach Towel cross is the major factor in the family’s recent results. A 7 win Astreos half sister to Somebeachsomewhere, named Child From The Sea,was bought off the track and exported to Australia and bred (almost inevitably) to Mach Three for a filly who is now a 3yo called Mariquita Amor. She has had only two starts this season for 1 win and just over $11,000. A Mach Three colt and another Mach Three filly have followed before a switch in breeding was made last season to Courage Under Fire. These matches of course put Beach Towel further back in the pedigree and bring in another totally different maternal line via Astreous (and one that at first glance doesn’t look particularly strong but it’s not a family I’m familiar with). It will be interesting to see what eventuates! Overall, Somebeachsomewhere has a very nice family but not an outstanding one. You could argue the Beach Towel x Cam Fella mare cross (same as Jenna’s Beach Boy) and now the Mach Three x Beach Towel mare cross (Somebeachsomewhere and Sir Lincoln) are really underpinning the family’s success – but I think the family picture is more complex and less certain than that. Somebeachsomewhere had tremendous speed aided by a sensational gait and willpower. In my view his ability to stamp those mental and physical attributes may be more important for breeders to consider than what he brings to the table via his maternal pedigree. Let’s have a look now at Somebeachsomewhere’s outstanding son Captaintreacherous, and another instance where it is tempting to grab hold of a potential golden cross (Somebeachsomewhere x Artplace mare). Captaintreacherous’s dam, Worldly Treasure, is a full sister to pacing mare Worldly Beauty, who was a two-time Dan Patch Award winner and earned nearly $2 million lifetime. Their dam was World Order (1:53 $267,205) and her dam was Rodine Hanover. Yes, that’s the Rodine Hanover who is grandam of Art Major, Perfect Art, and Panspacificflight as well as being the dam of Real Artist and other very good racehorses from a range of sires. Suddenly we are getting into such a strong maternal line that we need to take more into consideration than a simplistic click between a sire and damsire which sort of ignores the tremendous wealth of genetic talent along the maternal bottom line. (Brittany racing manager) Myron Bell likes to say that any horse can be a great 2-year-old but it takes pedigree to be a great 3-year-old. Great 2-year-olds that come back to be great 3-year-olds have to have the maternal pedigree to carry them through the 3-year-old year. Any horse can get away with just having speed at two. This horse has a star pedigree and that is why we paid what we paid for him (Captaintreacherous) as yearling. It looks like shaping up as a battle of the Mach Three sons, in the same way that several sons of Christian Cullen are going head-to-head as sires in New Zealand. Auckland Reactor vs Sir Lincoln. If you look at these things as a contest. Both have very impressive records, but struck niggles and health issues that led to lost opportunities at critical moments. Sheer brilliance with flaws, vs talented professional with niggles. The temptation is to go with the one you most admired on the racetrack. But as a breeder, my focus won’t be on a close examination of their race or stakes statistics but more on the attributes they showed, and even more importantly family genetic strengths PLUS what would suit my mare in regard to both of those things. Let’s have a quick squizz at these two boys. The Direct Scooter sire line legacy here is via In The Pocket, and mainly his son Christian Cullen. In North America the Direct Scooter sire line has survived through Matt’s Scooter, and mainly his son Mach Three. The sons of Mach Three are in the same position of sons of Christian Cullen – exciting prospects, some already showing huge potential but – a bit like the story of In The Pocket himself – it will depend on the opportunities they get, including whether the mares on offer (geographically and at the time) are what each one needs to really establish himself as a top sire. The Direct Scooter line has a reputation for leaving speed, often early speed. Some people call it a “hot headed” line, but that’s probably the flip side of having an injection of “want to go”. Mach Three raced very successfully as a 2yo. And of course with a reputation as a horse with early speed himself, he would attract many mares looking for exactly that quality: speed – which they may not have in large doses themselves. It’s not surprising, then, to find lines with toughness coming up in his mares’ pedigrees – Live Or Die, Cam Fella and his sons, and Beach Towel of course. None of these horses were slow, but their mares tended to be more staying types, tough types rather than sprinters. Falcon Seelster mares also fall into that category – as a generalisation. Auckland Reactor did not race as a 2yo. But in the next year won the Sires Stakes 3yo Final against Fiery Falcon, Benny Mac, Cavalier, Ohoka Arizona and Steve McQueen. He would have been a big lanky 2yo and wisely not pushed. Sir Lincoln raced but did not win as a 2yo, but was well represented in the Young Guns Heats of his year – with a 3rd, 4th, 4th, and 6th to the likes of Smiling Shard, Five Star Anvil and Devil Dodger before firing off his 3yo season with a win in the Sires Stakes 3yo Final. His 3yo opposition including Courage To Rule, Smiling Shard, Russeley Rascal, Gomeo Romeo and Kotare Mach. Auckland Reactor won 11 of 11 starts as a 3yo. Sir Lincoln won 8 of 18. Auckland Reactor has a reputation of brilliance, and the ability to be super-fast. But did he sometimes win more by dominating through his reputation? Did others sit back in awe and let him get his way? And when he was challenged, was there sometimes a weakness? At times there were nagging doubts, and in this industry the critics are quick to pounce if a champion turns out to have hooves of clay sometimes. Sir Lincoln has a reputation of strength, but his niggles meant there were times when he underperformed in races, and disappointed. There was always a reason. But he didn’t stamp his dominance on top fields in the way you really wanted him to do. He is an extremely handsome, well conformed horse, but lacks the dashing, exciting aura that Auckland Reactor had. Do either of them come from a family strong enough to give thoughtful breeders reassurance? That’s the big question. If Sir Lincoln’s dam Clare De Lune (by Beach Towel) clicks so well with Mach Three – the same Mach Three x Beach Towel cross of Somebeachsomewhere – that is one thing to ponder on. Her filly Lincoln’s Megastar won just last night, first up and impressive. But Clare De Lune’s lack of real success with any other sire leaves me asking some important questions. Is this a family going places, an engine room that is cranking up power? Or is it serendipity – a happy coincidence of a specific nick that works well, a narrow window of opportunity that may relate to a particular mix rather than compatibility with a wider pool of sires and (for Sir Lincoln) mares? Clare De Lune’s first foal by Bettor’s Delight could not get a win in 48 starts. And the 2012 foal to Rocknroll Hanover is her only other live foal deviation from Mach Three to date. Even though there may well be non-genetic reasons for these outcomes, one thing breeders do look for (or should look for) in a mare is her ability to leave successful foals by several different sires which indicates what some call a “double copy” mare, or perhaps a mare that is calling some important shots in the genetic roll of the dice and really adding value. Ray Chaplin from equineexcellence.biz in Australia has looked at the same issue for Somebeachsomewhere and his super son Captaintreacherous (by an Artsplace mare) and has a warning for breeders who are latching on to copying that as the next generation cross. Copying successful matches may not be the oracle it appears. You can get a copy of his very interesting article by contacting him at equineexcellence.biz – the link is on my home page. Auckland Reactor’s family has a stronger look to it in terms of producing qualifiers and winners. Atomic Lass had wide ranging matches for progeny and overall deserved her prize as Broodmare of the Year. That is exactly the “double copy” type indicators I was referring to above. There are a couple of active branches of Atomic Lass’s family now from her fillies, and Tony Parker is doing a great job in managing this family’s fortunes – although I wonder if the success of Auckland Reactor and the subsequent matching of several different mares from the wider family to Mach Three is more for commercial reasons or pedigree matching reasons or a combination of both. Personally, I believe each branch starts to add complexities to the equation and it is not as obvious as going to the same sire. Having said that, the October Brown filly by Mach Three from the Badlands Hanover sister to Auckland Reactor (Twilight Beauty) looks a promising type. Devil Dodger, May Fly and Silence Is Golden (a beautiful Grinfromeartoear mare who will be the best producer from this family I predict) are others recently or currently making their name. And Mr Parker is an extremely astute breeder! Where would I go – Sir Lincoln or Mach Three? I imagine the price difference will not be great. Sir Lincoln will be marketed on his “Somebeachsomewhere” cross and his handsome conformation. Auckland Reactor on his brilliance and fantastic public aura. It’s a choice I delight in seeing, two classy customers with something to offer, both of which individual breeders need to assess carefully in regards to their own mares – rather than their own preferences for the horse they saw racing.